I don’t think anyone (with the possible exception of Andy Reid) was shocked when Juan Castillo didn’t work out on defense. But nearly everyone was surprised at just how far Michael Vick regressed from his star season in 2010. The big problem Vick had was simply turnovers. After posting zero interceptions through his first eight games the previous season, Vick was picked off 14 times in 13 games in 2011. That’s not nearly good enough if the Eagles want to rebound and make a run into the playoffs next year. So let’s go a little deeper to try to understand some of Vick’s interception woes, using some stats from Pro Football Focus. Today I want to split Vick’s plays into two categories: regular and under pressure. Let’s look at his non-pressured stats first. When not threatened by sacks or hits, Vick completed 69 percent of his passes, good enough for 8th-best among the 24 quarterbacks who took at least 50 percent of their team’s offensive snaps. That completion rate jumps to 76 percent and 6th-best when you don’t count drops against him. As to interceptions, Vick was slightly below average, but not by much. He was 15th out of 24, with an interception rate of 2.5 percent. For reference, Eli Manning was 14th with 2.4 percent, and Drew Brees was 11th with 2.1 percent. 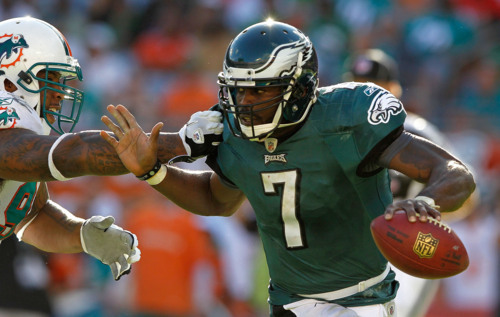 Overall, Vick showed room for improvement, but no big problems when he wasn’t pressured. When he had defenders in his face, however, Vick’s performance was more of a mixed bag. On one hand, he had the 5th-highest touchdown rate and the 2nd-lowest sack rate among those 24 quarterbacks. With only 11.6 percent of all pressured dropbacks turned into sacks, Vick’s famed elusiveness served him well avoiding a big loss. There are two takeaways from this information. One is relatively straightforward: Vick needs to handle the pressure better, even take a few more sacks rather than expose himself to interceptions. The rookie Dalton, who threw zero interceptions under pressure, also threw the ball away in those situations more than anyone else in the league. Vick could learn something from that example. But the second takeaway is more nuanced. For the last two seasons, Vick has been under pressure more than nearly any other quarterback. Last year he ranked first overall with pressure in 39.8 percent of his dropbacks. In 2010 he was second, with 41.8 percent. Given the improvement along the offensive line year-over-year, it’s likely that this has more to do with Vick than his blockers. Football Outsiders sack timing stats show that more than half of his sacks take longer than three seconds, which partially can be attributed to avoiding defenders, but also results from his tendency to hold on to the ball too long. Vick is a playmaker when he scrambles around — his touchdown rate is actually higher with pressure than without. But avoiding sacks and trying to score big also led him to turn the ball over far too much. Perhaps Reid and Marty Mornhinweg should focus on teaching Vick to avoid more of those situations by making pre-snap reads and quick decisions about where to go with the football. If DeSean Jackson returns, there will still be plenty of opportunities to create big plays, even without dancing around in backfield. If he doesn’t become more consistent and less turnover-prone, Vick will continue to be a liablity going forward. Tagged with Philadelphia Eagles, NFL, Michael Vick, Quarterback, Andy Reid, Marty Mornhinweg, Offseason, Interceptions, Touchdowns, Sacks, Pressure, Pro Football Focus, Football Outsiders, Statistics. February 8, 2012 by Brian Solomon.